In earlier posts I have shared Google Docs templates for creating Emoji Rebus Stories for both Wintertime and Valentine's Day. With Fall coming soon, I have put together a Halloween-themed version. Anyone who grew up reading Highlights magazine in the dentist waiting room will quickly recognize a rebus. Basically it is a story where some of the words are replaced by images. This can be a fun activity for students, both to create and to read. It may even help with younger students who are not proficient at spelling but can choose the image for the word they want. 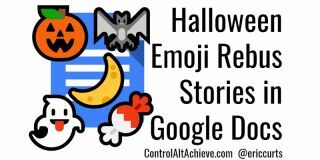 The template includes directions, and a collection of sample Halloween-themed emojis the student can use in their writing. Write a story that uses text, but also with images in place of key words. For the images, you can use the emojis that are included with Google Docs. You can copy and paste emojis from the sample emoji bank provided at the top of the document. Or you can add any emoji of your choice by clicking "Insert" then "Special characters" then "Emoji"
From that window you can browse, draw, or type in a search term to find the emoji you want to add to your document. Note: Emojis appear differently on different operating systems. Because of this, the images may not look the same on every device. If you are using any modern computer or device (Chromebook, Android, iOS, Mac OS, Windows), the emojis should display well. However if you are using an older version of Windows earlier than Windows 8.1, the emojis do not appear in color and many may be missing. For another great Halloween-themed activity, be sure to check out my earlier post "Build a Jack-O-Lantern with Google Slides". This activity allows students to use their creativity to make their own jack-o-lantern, while learning helpful computer skills, and then work on their writing skills by describing their creation.